VANDENBERG AIR FORCE BASE -- A quarter-century since its first launch, preparations are underway to end a hiatus and return next Tuesday to the business of launching Delta 2 rockets, if only for a little while longer. The United Launch Alliance vehicle debuted on Valentine's Day 1989, and since then has flown 150 more times over the past 25 years. It has performed successfully a remarkable 149 times, including the last 96 straight launches. But there's been a gap for the past two years with no flights. The matching of ready payloads with the rocket meant no launches until this summer when the start of the final sendoff to the Delta 2 begins. There's pieces and parts to build just five more Delta 2 rockets and four of them have been sold to NASA. First up is OCO 2, the replacement Orbiting Carbon Observatory to launch Tuesday from Vandenberg Air Force Base in California, exactly 32 months since the most recent Delta 2. A soil monitoring satellite follows in November, then a weather spacecraft in November 2016 and an ice observing craft in late 2017, all launching from California. Attention is turning to this summer's mission, the hardware is stacked on the launch pad and clocks are counting down the final days before liftoff. 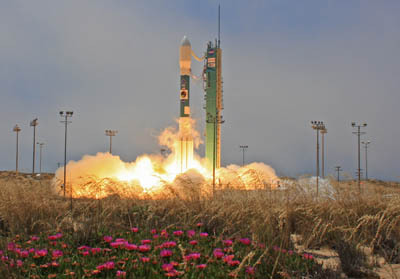 For a time, it appeared the Delta 2 would fade into history after carrying a climate and weather observatory into orbit for NASA in October 2011. After the U.S. Air Force transitioned its launches of new Global Positioning System satellites to the Delta 4 and Atlas 5 rockets, the Delta 2 lost its anchor customer. But NASA breathed new life into the rocket two summers ago, purchasing four future flights from an inventory of five remaining Delta 2s. NASA has used the Delta 2 rocket on 50 launches to date, most notably to send the Spirit and Opportunity rovers, the Odyssey orbiter and Phoenix lander to Mars, plus the Stardust and Genesis sample-return spacecraft, MESSENGER to orbit Mercury and the Spitzer infrared space telescope. The three solid rocket boosters for the OCO 2 mission arrived before the holidays, the second stage shipped in mid-February and the first stage arrived in mid-March. "Delta 2 production restart efforts have gone amazingly well and we're very pleased with that," said Tim Dunn, the NASA launch director for OCO 2. Erection of the first stage at the Space Launch Complex 2-West pad occurred on March 28, followed by the solids and then the second stage on April 15. A countdown dress rehearsal was held on May 21. The team then completed a first stage RP-1 fueling and leak test in early June. "I have been amazed at the retention of the appropriate skills and personnel ULA has kept. They have done a wonderful job with personnel to keep Delta 2 viable," Dunn said. OCO shipped out of its Orbital Sciences factory in Arizona a5t the end of April and went to the Astrotech processing facility at Vandenberg for a month of final processing. 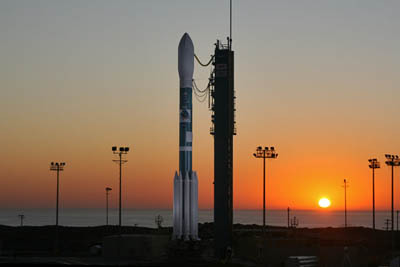 It then moved to the launch pad to join the Delta 2 on June 13. The integrated test between the payload and rocket follows on June 17, leading into the fairing installation on June 21. Launch is scheduled for July 1 at 2:56:44 a.m. PDT at the opening of a 30-second window. "It's exciting, as you can imagine. The entire team is very energized to get back into Delta 2 work," Dunn said. "The ULA team, everyone has been coming forward, raising hands, from the Denver design center to Decatur production to the launch site, 'I really want to work that hardware.' There's just an electricity among the greater Delta 2 team to get back into launching this vehicle." The SLC 2-West pad was placed in quasi-caretaker status for a while before going back into normal cycles of maintenance a year before launch. Dunn said all systems are go. The Orbiting Carbon Observatory 2 becomes NASA's environmental satellite dedicated to mapping atmospheric carbon dioxide and man's impact on Earth. The Delta will insert the observatory into a 438-mile polar orbit to collect about 8 million measurements every 16 days to create maps showing global distribution of carbon dioxide. Next will be SMAP, the Soil Moisture Active Passive satellite, set to launch on Nov. 5 at 6:16 a.m. PST. Outfitted with a radiometer and synthetic aperture radar, the craft will orbit 423 miles above to Earth make global measurements of soil moisture to improve flood predictions and drought monitoring. Then comes JPSS 1, the first civilian weather observatory in the Joint Polar Satellite System launching in November 2016. The craft will be operated by NOAA in a 512-mile-high orbit to take the planet's pulse daily for global forecasting, providing the ingredients needed for long-term weather outlooks. And the last currently-scheduled Delta 2 carries ICESat 2 in 2017 to continue work begun by the program's original spacecraft, which has since been retired after a seven-year mission that monitored the melting Arctic polar ice cap. 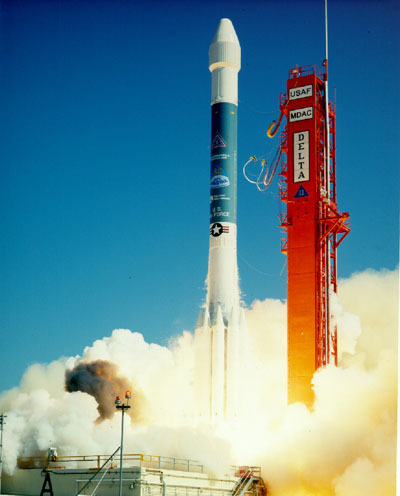 A Delta 2 launched ICESat 1 in 2003. The Delta 2 will put ICESat 2 into a 373-mile polar orbit where the craft's multi-beam micropulse laser altimeter will provide precise global ice topography measurements of polar ice sheets and glaciers, study ice thickness and examine sea surface and vegetation heights. There is one final Delta 2 still up for grabs.